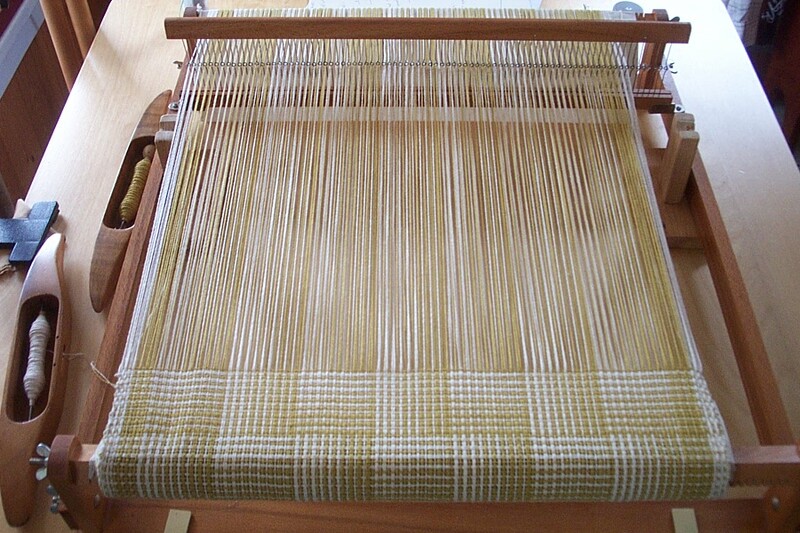 My first warp on the Varpapuu table loom needed to be low-risk, since I had no clue how well the loom would weave, or whether the very small rust spots on the reed would transmit stain. Nothing too light or precious. Back to the putty-brown 8/2 cotton mill ends then, with some unbleached-linen-colored stripes by the edges to keep it from boring me! 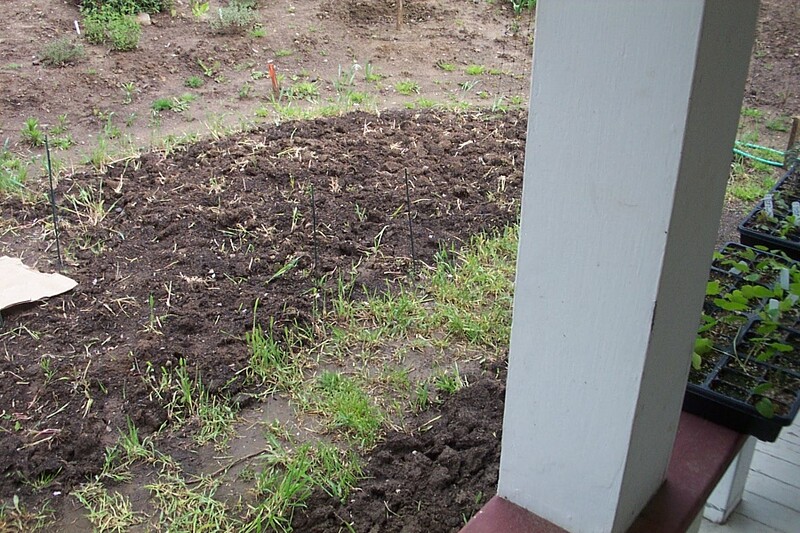 I warped up about 6 yards and threaded for 8-shaft rosepath, 12 inches wide in the reed. 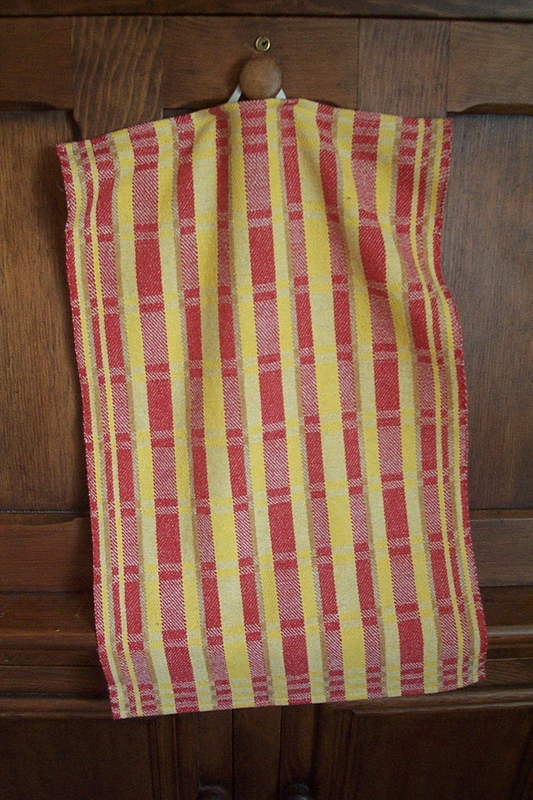 So far I have woven off (and cut off, and wet finished) a bunch of samples, mostly in the form of napkins. This was the first time I used the double stick header described by Peggy Osterkamp to reattach a warp-in-progress to the cloth beam. I was nervous I would do something dumb like cut in the wrong place, but it worked out fine. For the second half of the warp I wove some more samples, then started this little runner based on the information I’d gathered from my wet-finished rosepath twills. It’s a gift for a couple who loves Mata Ortiz pottery, and that’s all I really know about their taste; the general idea is to end up with something that will complement the vivid earth tones and set off the high-contrast geometric patterning of the pots. Last month I quickly made myself comfortable with the Varpapuu table loom and worked out the easiest way to follow drafts. When I showed him my color-coded levers and notation system and explained, “numbers just confuse me,” Der Mann laughed out loud. 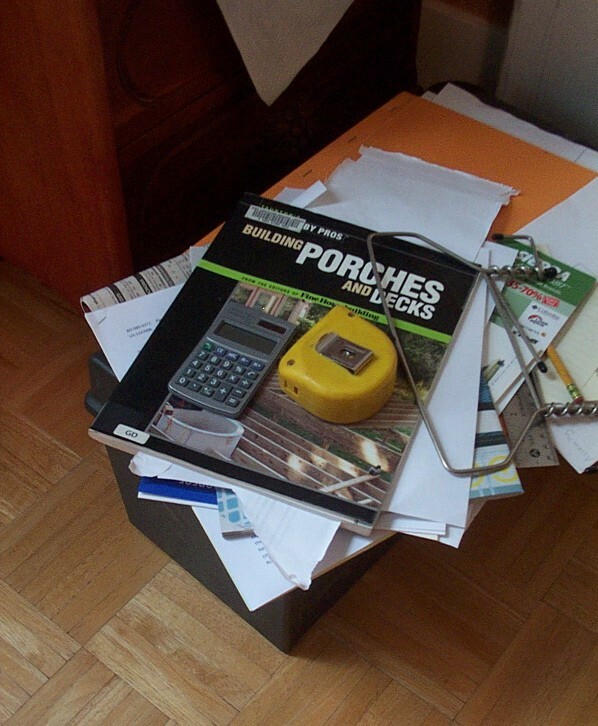 He has seen me planning weaving projects, the pages and pages of scrap paper scribbled with numbers and diagrams that drift around the house; he’s heard me mumbling numbers as I wind my warps. What can I say? There are numbers, and then there are numbers. Some you need, others just mess you up. 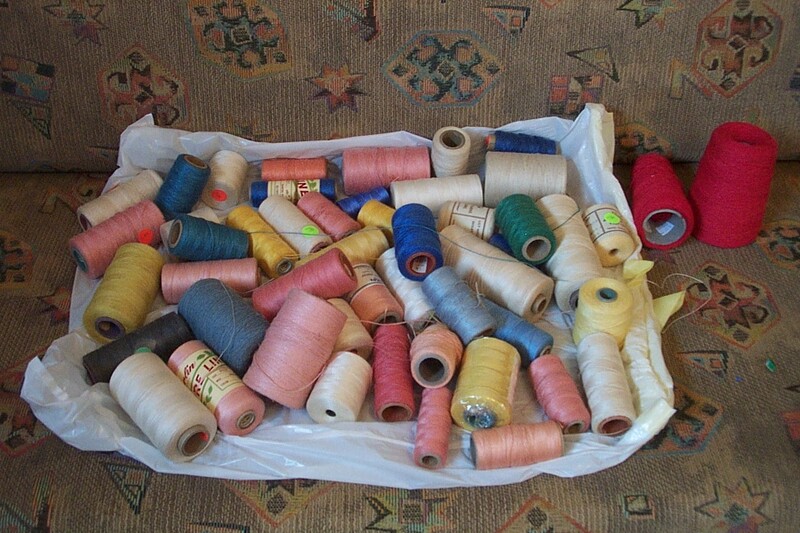 Once again, Meg hosts a New Year’s peek at a bunch of people’s looms! I counted, bundled and washed these loom-components yesterday because they stank the with stink of the former owner’s sprayable de-stinkifier. I don’t really believe in washing heddles, but let me tell you, I had no choice. They are drying on the sewing machine table out of the reach of the cat. Above center: Varpapuu Kothe Nordia 8-shaft table loom with cracked floor stand, circa 1970’s, 31.5 inch weaving width . . .
. . . which is still recovering from it’s de-stinkifying ordeal by soap and water. Those cute Finnish shuttles on the sewing machine table came with the loom as well. Also the plastic bed-lifters. Ah, craigslist! I bought it the day before yesterday, now all that’s left to do is to put the shafts back together and string ‘er up. Above right: Bergman 8-shaft countermarche. Also known as the moveable hat shelf, as you will notice it has moved from one side of the room to the other since last January. 2012 was a year of pain and illness. My back is not improving. I can’t treadle this loom unless it does. 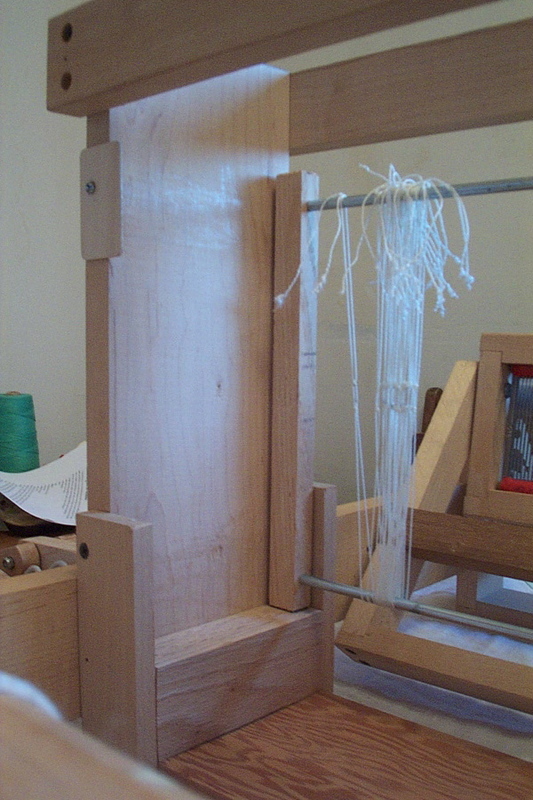 The standing inkle loom has another 20/1 linen band on it. 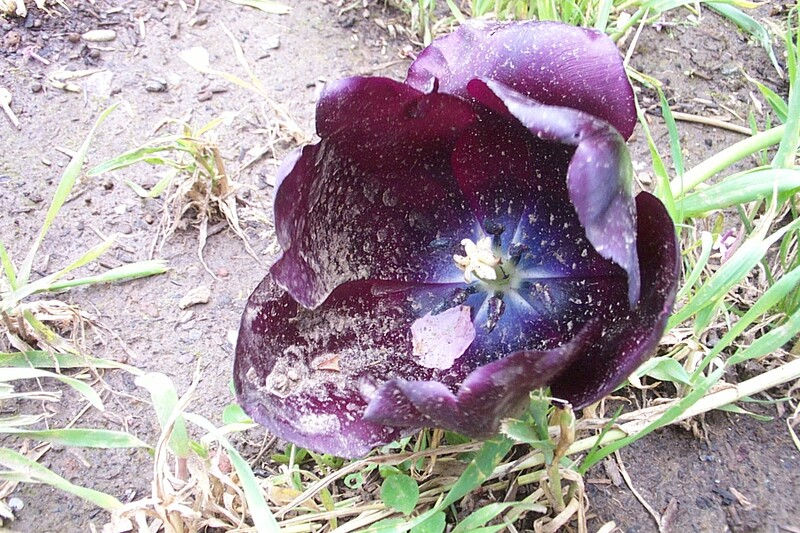 I made three others in 2012, maybe I will blog about them some time. 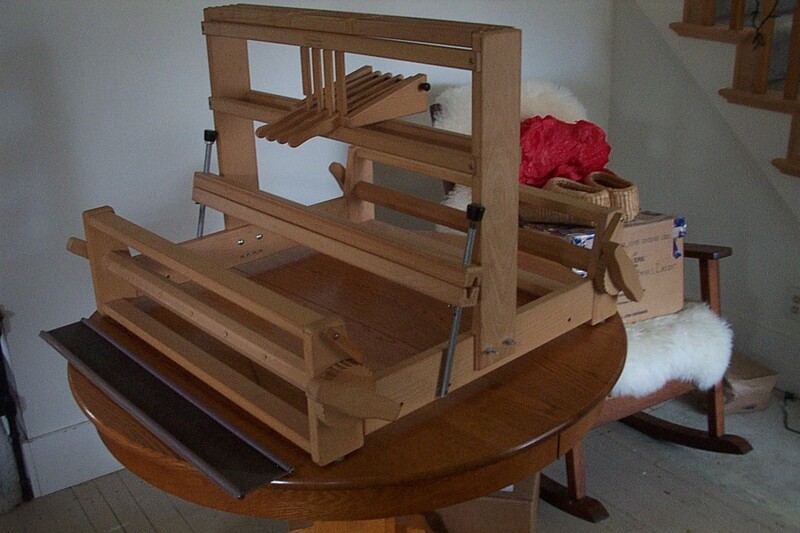 The Glimåkra table loom of last year is still incomplete. It turned out to be surprisingly hard to find the right size of lumber for Pysslingen heddle bars, for so many reasons. After a failure with warpy oak I scrounged the last straight pieces of some clear Douglas fir at a restoration millwork place and made the bars. That is where I stalled out: my next step is making a jig to accomplish the precision drilling to add the hardware to the bars, and you know what? I don’t really like to fix looms. I’m tired of it. I would rather weave. That is why I decided to get the Varpapuu. Plus, the price was right. Plus, it has eight shafts instead of four. And it’s wider. And deeper. I do still plan on finishing making the Glimåkra heddle bars, just not right away. Today I de-rusted my warping reel and planned my first warp for the Varpapuu. Tomorrow I will wind it and beam it. These are for my aunt, to complement a mural she means to paint in her kitchen. They got rumpled in my photo shoot. I am debating with myself whether to simply press them smooth and pop them in the mail, or take them with me to visit a local potter by appointment, buy a vase to go with them, and send that too. 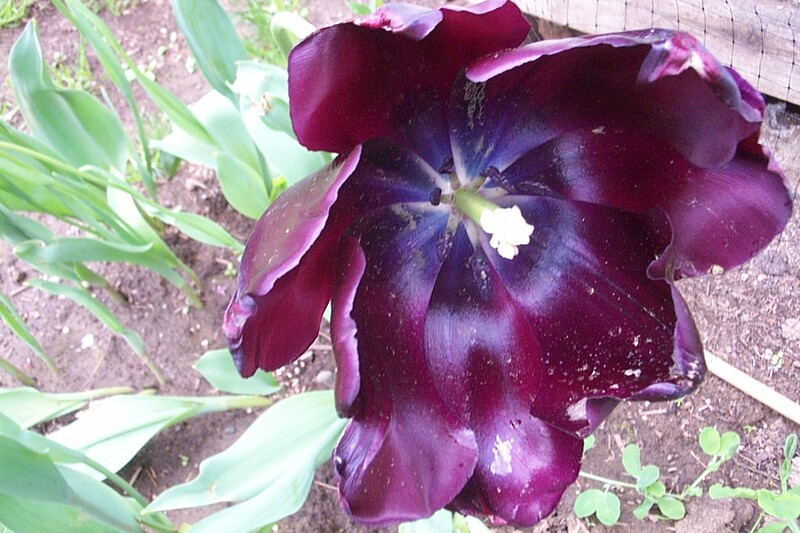 I have a specific vase in mind–carved black-eyed Susans with a carmely-mustardy glaze over the top, if she still has it. I’ve been kicking myself for not buying it when I visited her stall at a Christmas bazaar. I wound the warp for these towels ages ago, planned them eons ago. 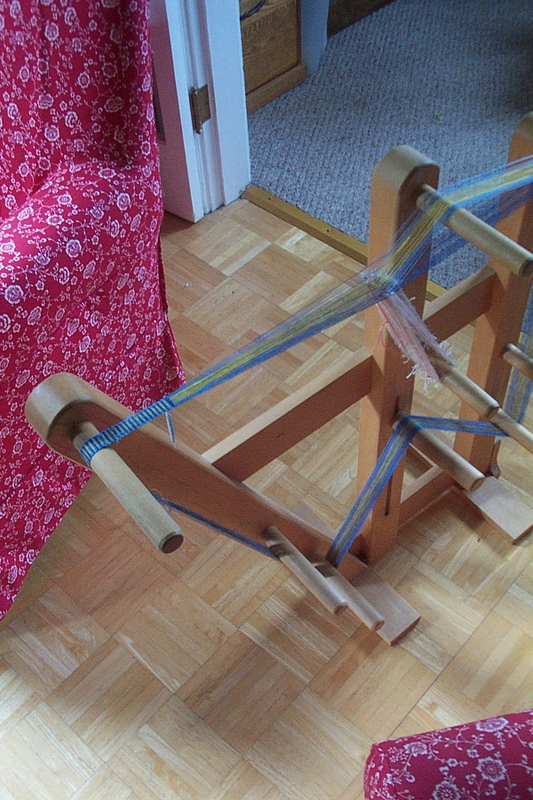 My table loom couldn’t tension a linen warp properly, wouldn’t create a shed that supported one of my usual Swedish shuttles. I was going to use a narrow stick shuttle as an alternative. 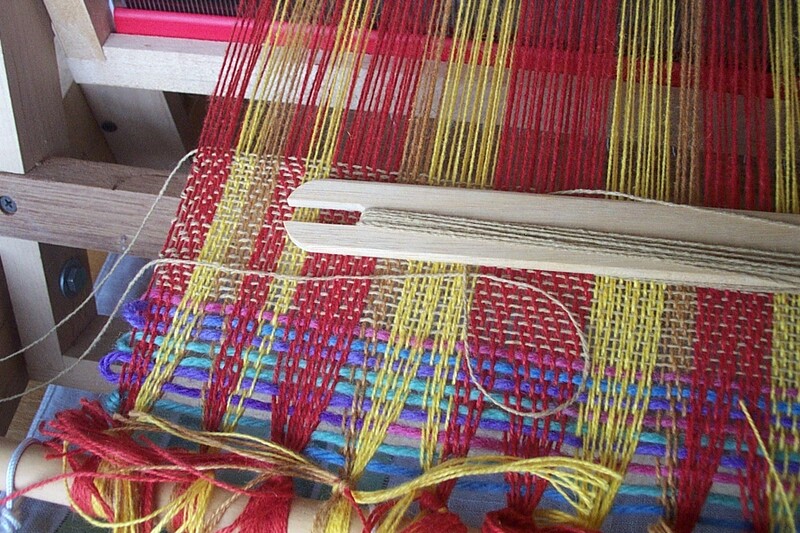 I began weaving that way, but the stick shuttle tended to catch up the wrong warp threads. Since my weaving was riddled with errors as well as being slow, I let it sit. 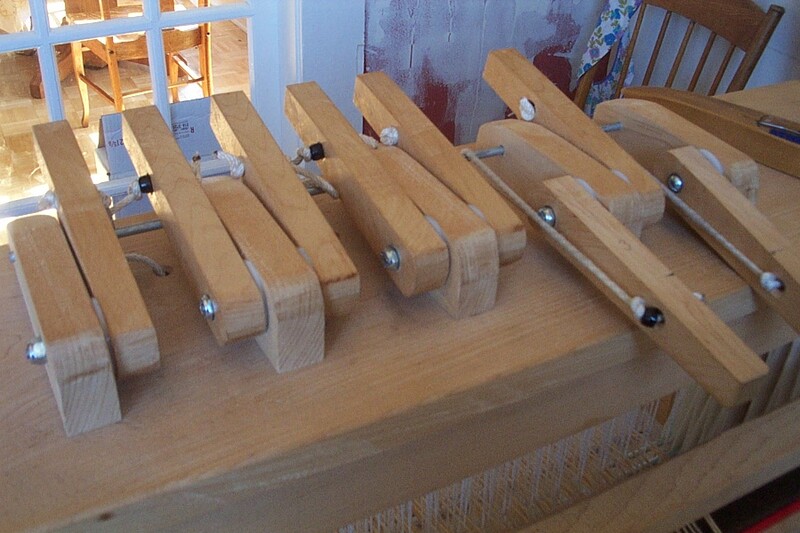 Months later I came up with a much better solution: both a slight alteration to the loom and to one of my shuttles. If you remove the poppana spool-holder from a poppana shuttle, it becomes a lovely lightweight double-sided ski shuttle that holds a lot of thread. Turned edgewise, it parts weak sheds and skims through them like a champ, no careful “poking” needed, and no errors. If I keep the table loom, this is probably the shuttle I’ll use with it. 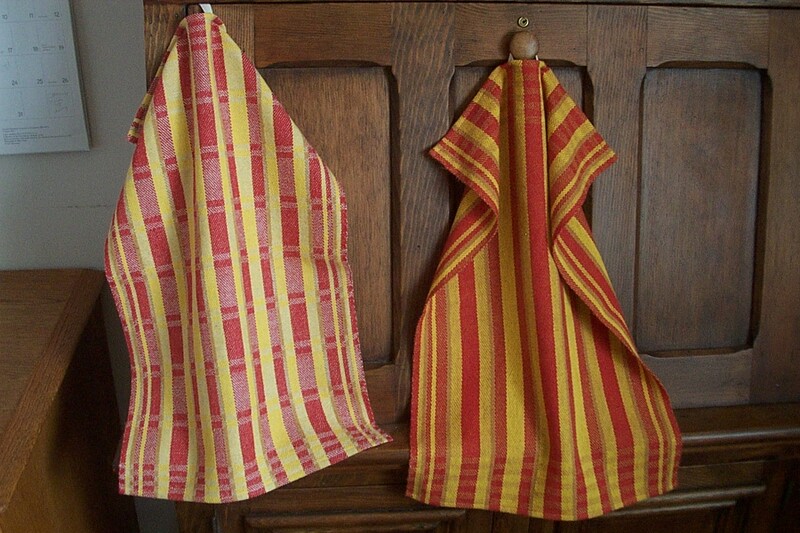 I have pictures of the Vävmagasinet towels on which I based these, but I can’t find them. If I do find them, I’ll explain my adaptations in a separate entry. Warp: red-orange (Klippan #317), daffodil yellow (Venne), and light umber (Klippan #1165) 22/2 cottolin, 33 wpi. Weft: 22/2 cottolin in light umber for striped towel (Klippan #1165) and linen-colored cottolin for the checked, both 33 wpi. Warp preparation: 5 yards and 17″ on reel, cut in half for 2 yd 26.5″ warp, wound singly (but could have done in threes), beamed in quarter inch raddle. Finishing: very warm machine wash, damp-dry on low in dryer, hot press. 1/2” Machine hems with preshrunk cotton twill tapes sewn in for hanging. Conclusions: I had to sley this warp 3 times: first at planned 21 epi, then (because sample cloth was too loose) at 24 epi, and a third time to correct a mistake. The 8/2 putty-brown cotton (32 wpi) weft I’d planned to use for these was also a no-go. The color was too desaturated and cold to bring out the interactions I wanted with the warp. 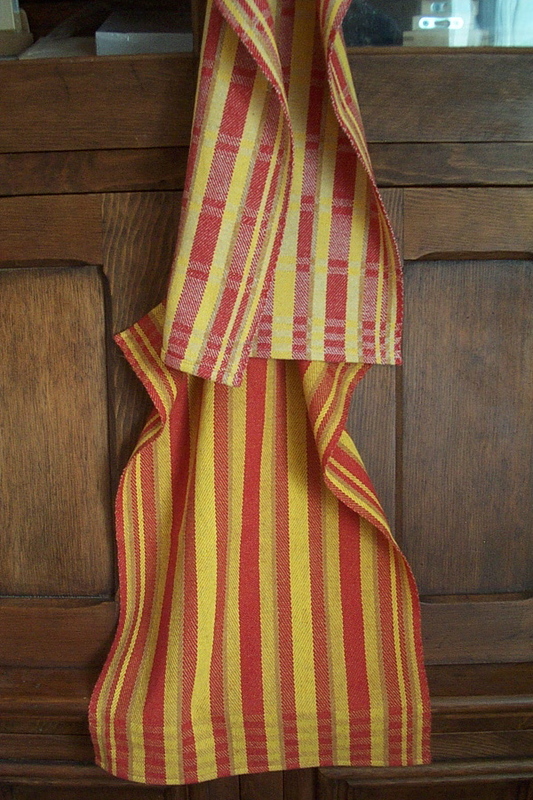 Instead I used matching umber cottolin for the striped towel, and linen-colored cottolin for the checked–fearing I’d run out of the umber if I attempted a second towel with it. What with sampling at the beginnings and end of the warp and retying it twice, 2 yards 26.5” was barely enough for two towels. They also turned out much narrower than I wished since I’d reduced the planned width of the warp by one full color sequence for fear of running out of yellow thread, then decided to increase the sett. 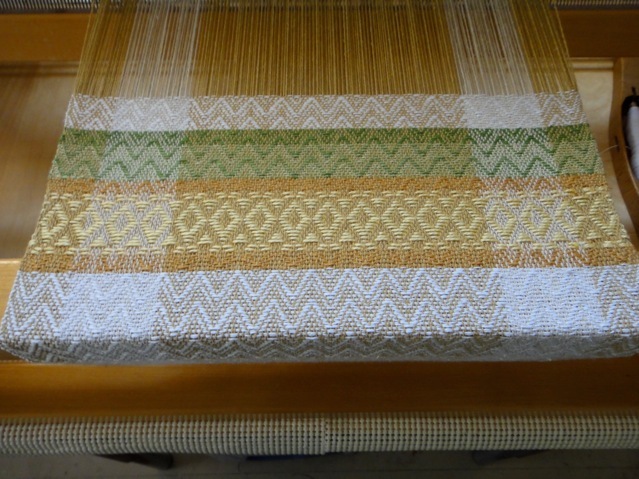 I’d have loved to have enough of this warp to make a runner in the pattern of the darker towel. Is this a sign I should stop designing projects that use up leftovers? To make the hems less bulky, I wove 2 picks of tightly packed sewing thread where I wanted each interior fold line. After wet finishing I removed the picks of sewing thread and pressed the first fold of each hem along the “score” made by the missing thread. This worked well. No need to pre-shrink cotton twill tape, as it stretches. Next time I weave jeans-twill towels with cottolin, I would prefer a slightly higher sett for crisper towels–25 or 26 epi would probably do it–though these were fine as they were. 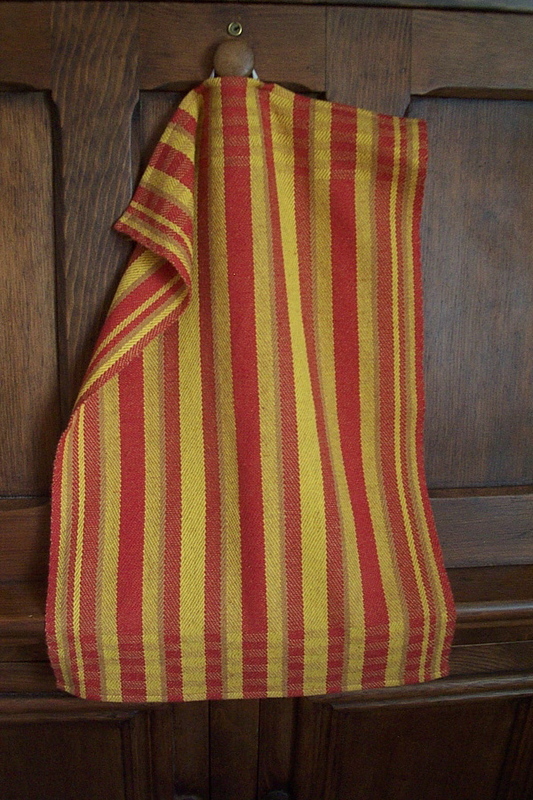 On the other hand, a set of 24 but with thicker weft might provide more color interaction between warp and weft. As would using weft of an intermediate hue/value somewhere between the extremes in the warp. Table loom: Modified, tweaked, tweaked some more, and finally at the end of its cottolin towel warp, with a Christmas kumihimo kit lying where I left it after unwrapping it. 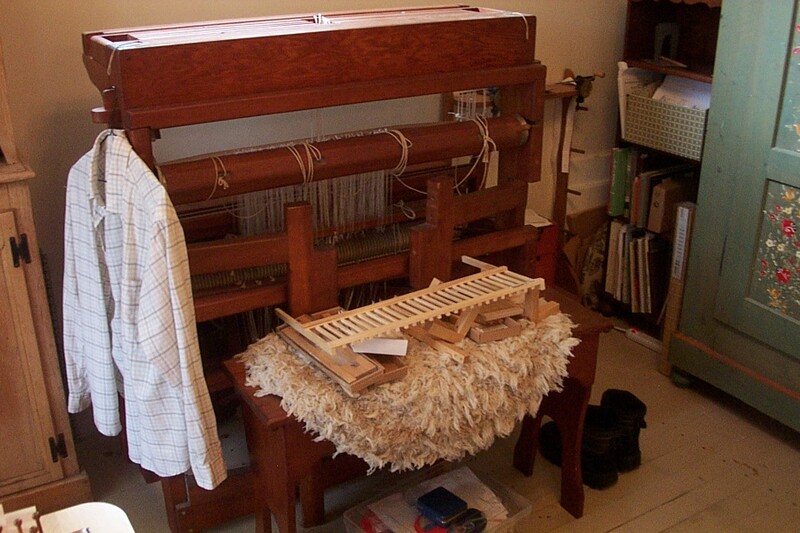 Bergman countermarche and Spears rigid heddle: Naked. Folded and cupboarded, respectively. 2010 was a hard year on my body and spirit. For much of it a gardening injury (yes, gardening injury) held sway. Weaving was minimal, blogging was beside the point, and yet, oddly enough, the glacially slow towel warp was my life-line last month. 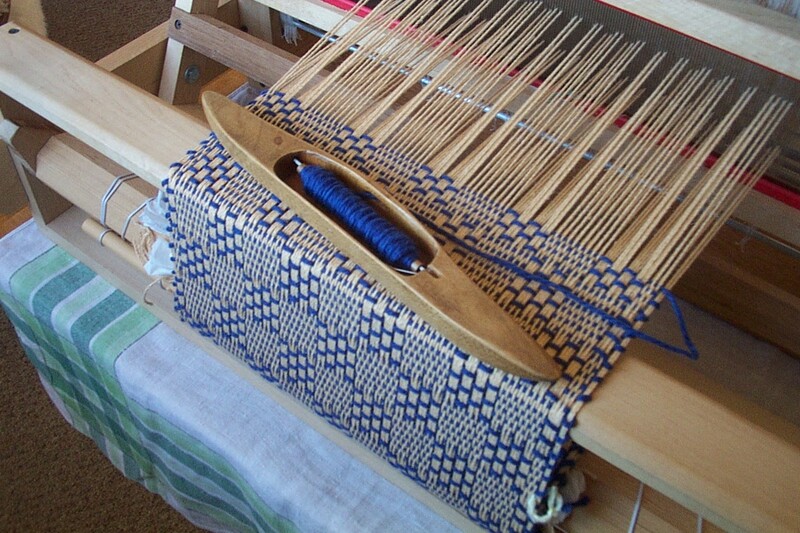 Like a Sisyphus making friends with his boulder, once I had tricked my third-hand home-made table loom into weaving linen, I found myself becoming attached to the plaguey thing. Who else would have gone to so much trouble over a simple dead weight? If I sell my boulder now, I will be putting a low price on my ingenuity. No one else will know its former foibles. No one else will know what they’ve got. And it stood by me when I needed it: all 100 pounds of 8-shaft Awkward. 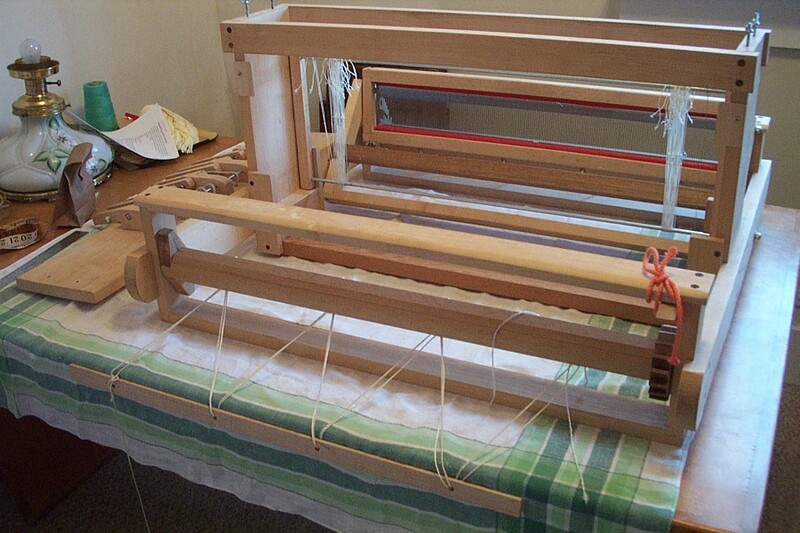 As for me on January 1, 2011, I’m more like my inkle loom, poised and empty between sample warp and project. After a prolonged, helpless presence at my grandmother’s hospital deathbed (I’m her only living descendent), and the visiting and worry of her final illness before that, for the past week I’ve fond myself back at home, waiting and sorting and taking care of business in a sort of vacuum before the funeral.
. . . and may not do much more than that for a while after the service. It’s funny the way our cat has started tucking himself up in the rocking chair over the last few days. Usually even his head’s curled in, so all I see is an alarming featureless lump–like an oblong fur cushion. 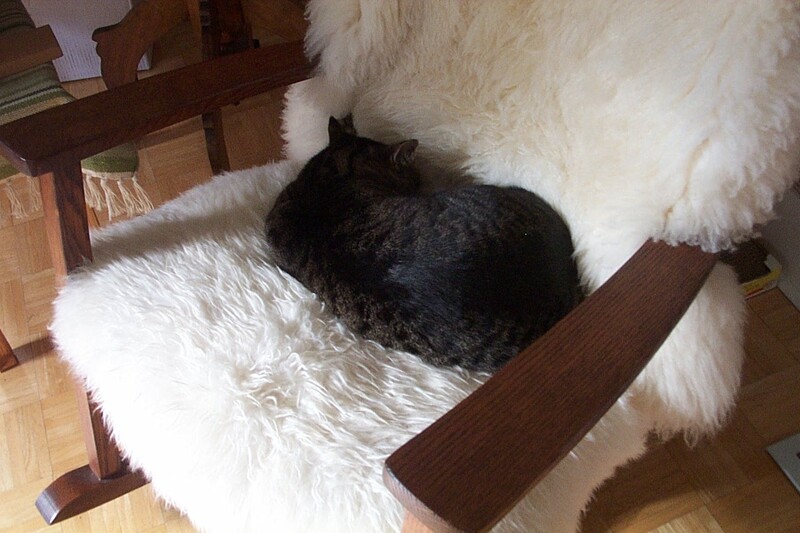 The sheepskin on the back of the chair is a New Zealand Merino I’ve had for years, but the one on the seat is an IKEA cheapie the cat used to loathe. When it was new he would get into fights with it, attacking the edges, tearing it off the chair as fast as I put it back on. At last he managed to rip off a good-sized chunk from the corner in a final conquering frenzy. After that he ignored it, and the chair too. Now it’s Mother Cat. He kneads it for a half-hour at a time before going to sleep. 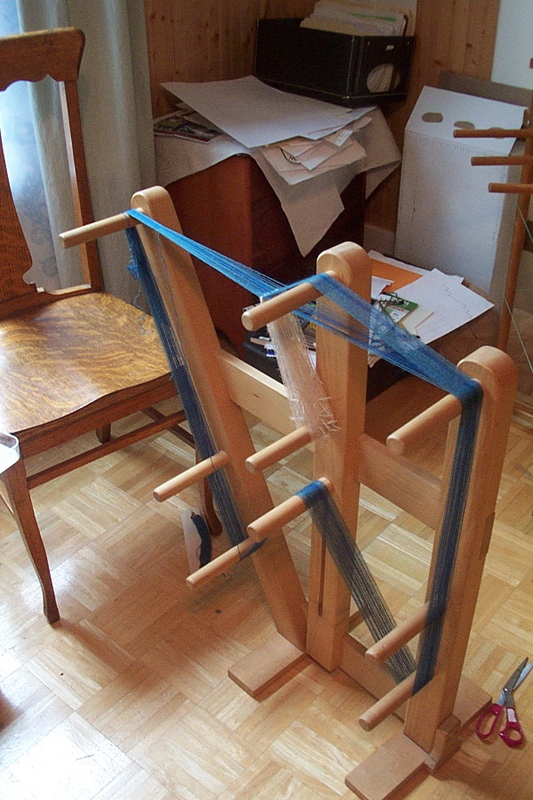 It’s not possible to weave 22/2 cottolin on my table loom. Even when the warp is at maximum tension, the floor of the shed is too loose. A thrown boat shuttle drops through it every time. So what am I going to do with my towel warp? Poke a stick at it. I tried several old stick shuttles meant for rags. 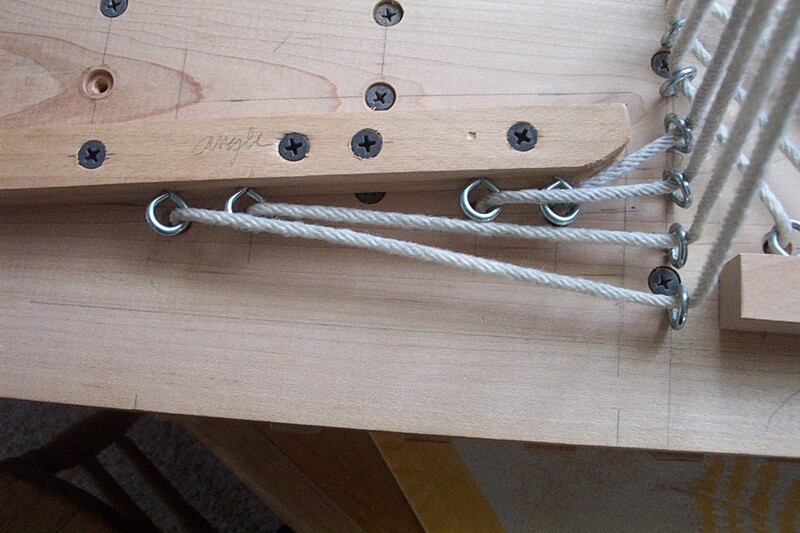 This is the lighter stick shuttle that came came with my rigid heddle loom. It worked better than the rag shuttles, which isn’t to say it works well. Every pick is like threading the eye of a needle. This will be an exercise in patience. 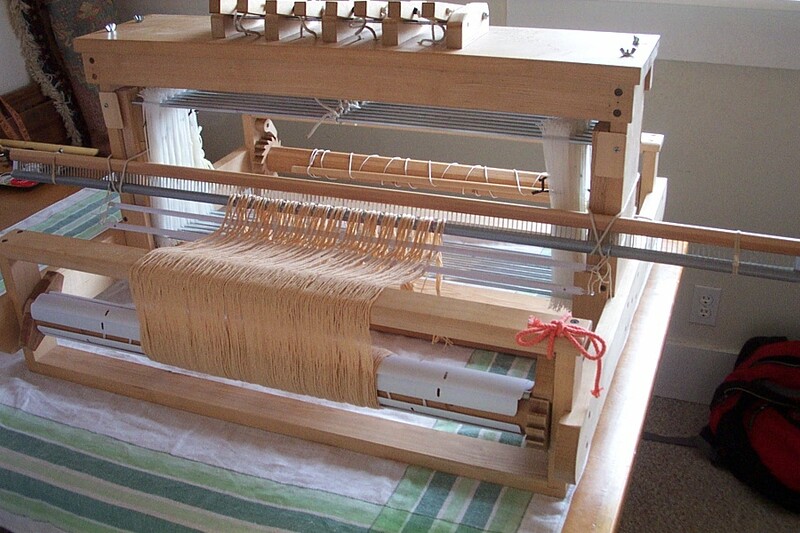 Dorothy told me she doesn’t do linen warps on her table loom because it’s too short to handle them. I thought the cotton in this yarn would give it enough stretch to work. That was silly. Of course the least stretchy fiber in a mixed yarn will be the one that has its way. The stretch in my part linen warp for the checked peach runner was all thanks to the plying, not the cotton. I finished my first project on the table loom about a week ago. It was nothing like weaving on my Bergman. 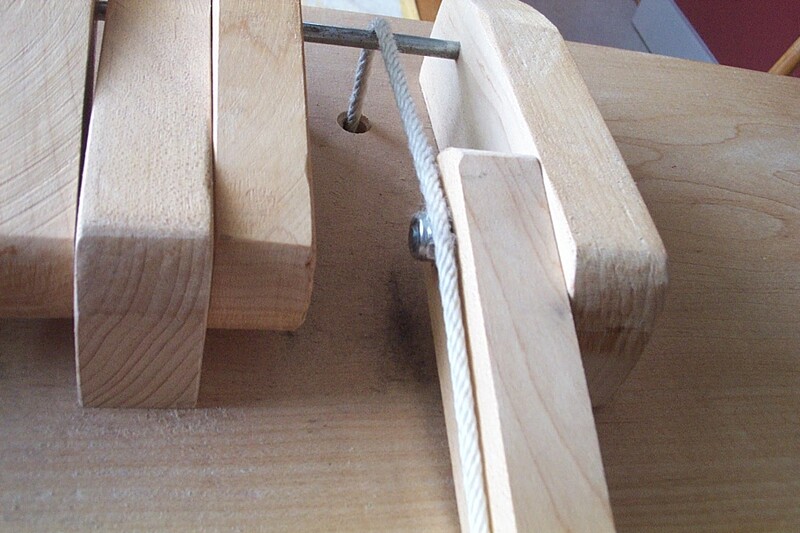 With the table loom, it made more sense to set the shuttle down between picks than it did to swing the heavy beater and work all the levers with only one hand. I would throw the shuttle, catch it, and set it on the breast beam while I changed the shed. I did develop a sort of rhythm for this, but it was all fermatas and full-measure rests! 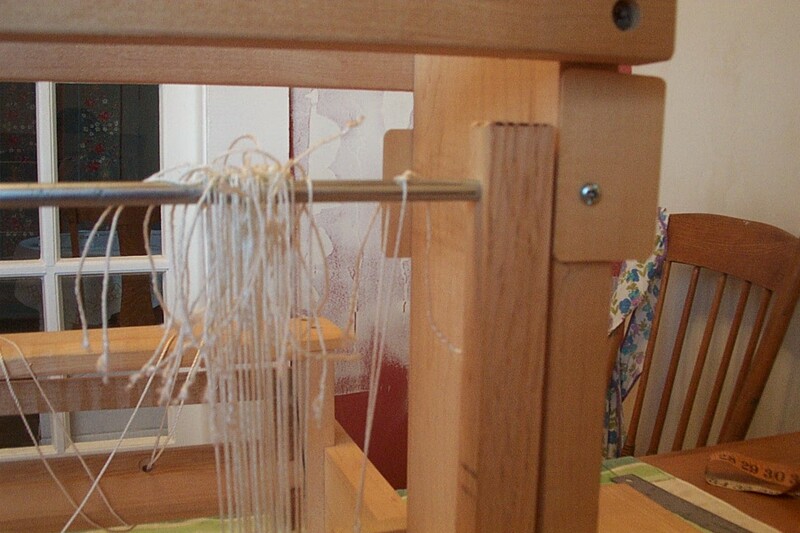 The loom is too tall to use sitting down, so I wove standing, which is probably better for me anyway. No strain except from threading (how I missed the Bergman’s removable breast beam!) and from staying on my feet for too long. Oh. And my hands got a little achy from the leavers, which require some effort to move. Why is that? My 60% cotton / 40% linen warp was part of the problem. If I kept it tight enough to support the shuttle, I could barely raise the shafts. If I left it loose enough to raise the shafts easily, the floor of the shed was too loose to take the shuttle very well. This wasn’t a fault of my loom in particular, it was just how how linen would behave on any short jack loom with ratcheting beams. The question soon came to me: why are there no sinking shed table looms? 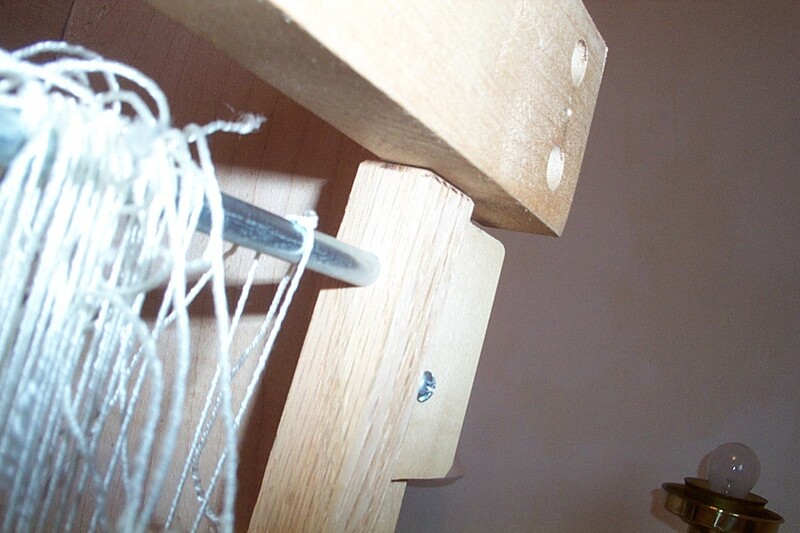 With a jack loom you make the shed by pulling some threads out of the way while leaving others in place. The ones you’re pulling away from the resting warp will have the greatest tension. Why not put those higher tension threads on the bottom of the shed, where you need them to support your shuttle? Then I got Dot’s comment on my last post and had a whole lot more to think about. Dot explained that one of her table looms was actually designed to have the resting warp angle down through the heddle eyes. It was a way of making sheds big enough to admit the shuttle on what otherwise would have been too shallow a loom for any but the smallest of sheds. This sent me to the Mountain Looms website with a terrible suspicion. Mountain Looms are no longer in production, but you can still look at the pictures, and they are designed the very same way! I supported the the shafts of my homemade loom on 2 1/8″ blocks to raise the heddle eyes to the same height as the breast and back beams. At the time I believed I was correcting a crazy mistake of the carpenter, who used a Mountain loom as a model. Well, he did make a lot of mistakes, but the shaft-height issue is more complicated than I thought. My loom isn’t particularly shallow for a table loom, and I am still getting quite spacious sheds after my modification. The original Mountain looms never left the heddle eyes more than 2 inches lower than the breast and back beams, like mine did. Before I put blocks under the shafts, this loom was opening a 3 or 4 inch shed, which is larger than anyone needs and which would have caused even more tension discrepancies. I couldn’t have left it as I found it. So that’s okay. But what if the home carpenter hadn’t botched the measurements for the lifting mechanism so badly? I might have been able to treat this as a a sinking shed loom. Instead of lifting the shafts up from a resting position on blocks, I could have hung them (if I was very clever) so that the warp was at rest when the shafts were in the up position, and the sheds were formed by releasing the levers so that the shafts fell back down to the bottom of the loom. This could work as long as the shafts were heavy enough to pull down the threads of the tensioned warp (I think they probably are); but it would be a weird design, because it would depend on having terribly heavy shafts! Frankly, as someone who likes to weave with fine woolen thread, I don’t even think the original Mountain Loom design is that great. I can’t like the stress it puts on the warp. Dot pointed out that there is more abrasion with Texsolv than with smooth metal heddles, but it still rubs me wrong (pun intended) to have to advance the warp under friction. So far my little researches and thought experiments have all pointed to the same thing–which is that table looms are a compromise. You already knew that, didn’t you? Their direct tie-up and hand-operated lift mechanism makes them ideal for weaving small quantities of complex-patterned cloth. 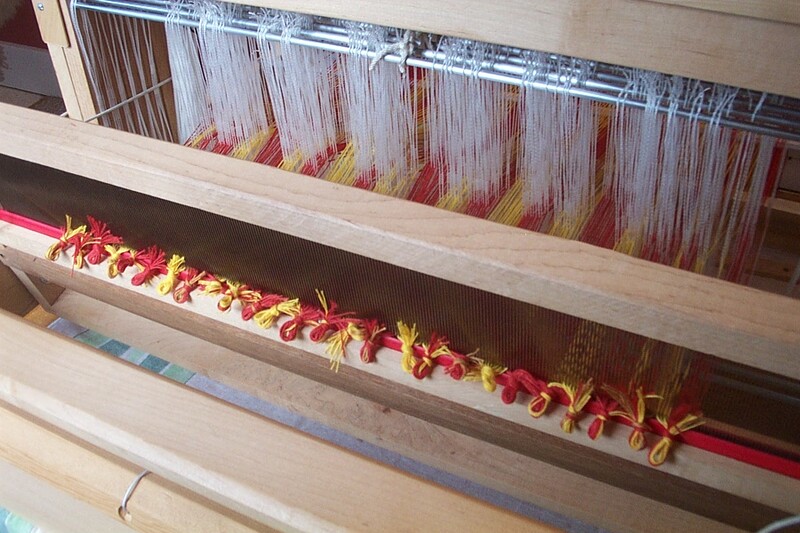 Nobody has ever claimed that they are the best kind of loom for anything else. 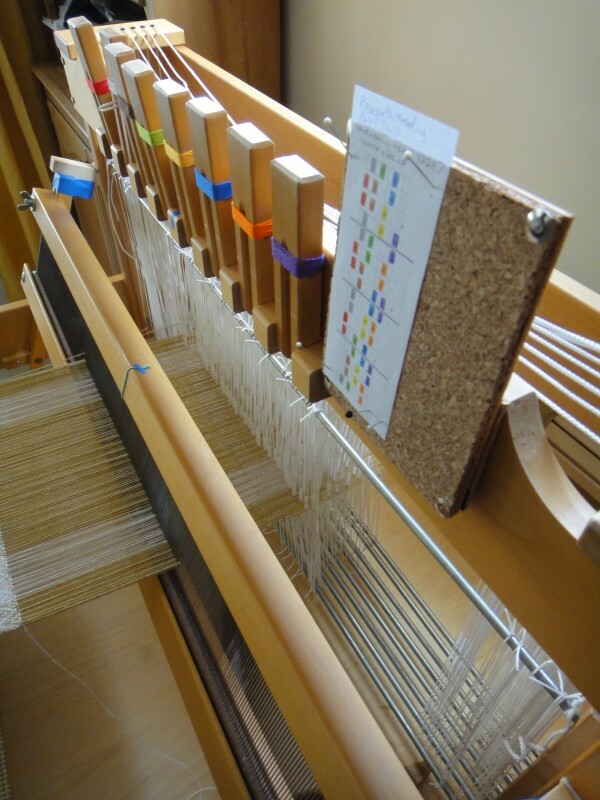 The verdict: a table loom is no replacement for a countermarche, but it’s a good loom for right now–maybe the next 4 months. Despite it’s absurd girth and general lack of refinement, weaving on it was a relief! 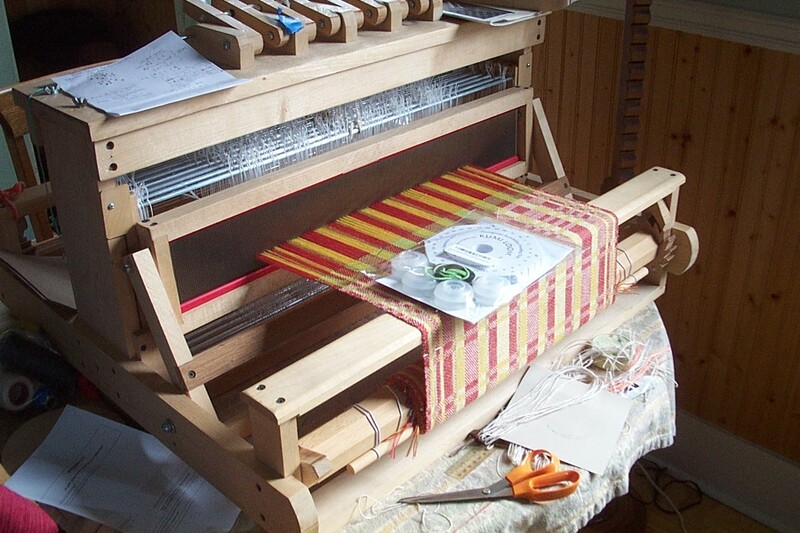 I was so surprised what a relief it could be just to put a warp on a loom and weave without the specter of pain, further repetitive strain injury, and the question of whether or not I might have to get rid of my loom hanging over my head. Once my SI joints learned how to act up, putting a warp on the Bergman was like embarking on a dangerous, difficult, possibly never-to-be-completed journey–crossing the Alps on foot, perhaps. To escape the Nazis. 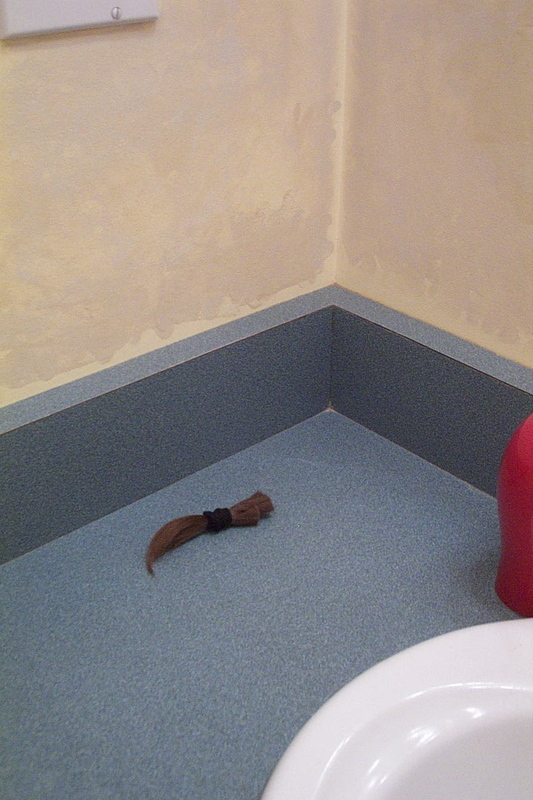 The worry and the prospect of physical pain were a bigger part of the ordeal than I’d realized. 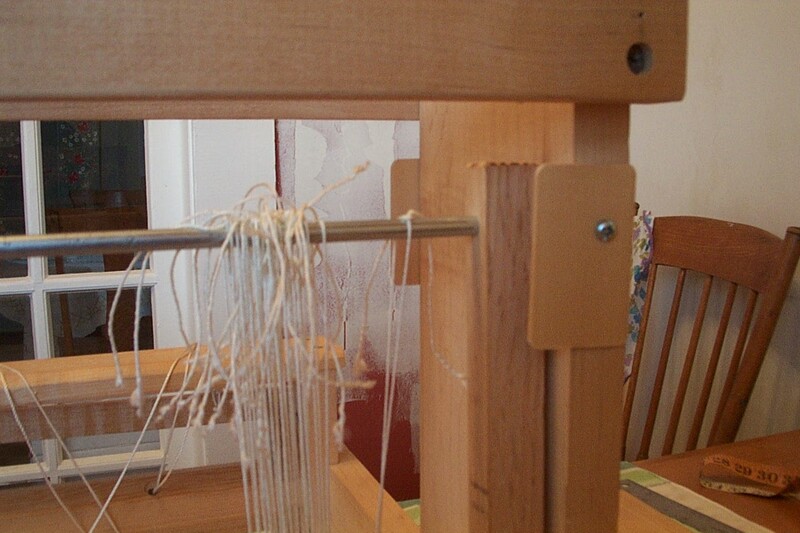 Well, It’s been nearly a year of beady-eyed stares and tooth grinding, but I finally got my table loom working. Since last May, I have discovered more design mistakes. Susan at Thrums titled a recent post about her kitchen renovations “Making a Silk Purse From a Sow’s Ear.” I might have used that title myself, because it is a pretty good description of what I have been doing. The thing that really shot me down was the problem of the shafts being too low. (Or the breast and back beams being too high, whichever.) One day I suddenly realized that when the shafts were at rest, the heddle eyes were exactly 2 1/8″ inches lower than the breast and back beams. The lady who sold me this loom had been trying to weave on a warp that followed a v-shaped path. Whenever the warp was advanced, each separate thread was raked violently through its own heddle eye. I didn’t notice this when I bought the loom. It never occurred to me to look: Who would expect such a glaring design flaw? No wonder the pop-henge lady wanted to sell. The next problems to solve were with the path of the lift cords, which caught on and dragged over the sharp nuts and protruding bolt ends, catching and fraying the cord when I worked the levers. This sent me to a specialty bolt store looking for low-profile cap nuts. I know. With a drill press and a willingness to take the loom completely apart, there would have been better ways to attach the levers to the loom than with regular bolts. I didn’t have either of those things. Since I didn’t know whether I could get the loom to work at all, a total overhaul seemed premature. The plain metal cap nuts weren’t an option–they just worked loose. This sent me on a search for locking nylon cap nuts. The nylon nuts protruded too far, especially since I had found it necessary to add nylon washers to cut down on friction between the levers and the lever assembly. I went back to using some of the plain, low-profile locking nuts from the bolt store. Fortunately, with the nylon washers taking up additional space along the bolts, the bolt ends no longer protruded pas the nuts, and the cord no longer scraped against them. I had also tied knots and used pony beads to push the cords out from the ends of the levers a bit. I fixed the problem by installing a new, smaller screw eye for one cord and fiddling with the heights of the other. The cords still cross each other a bit, but they travel at different elevations, so they don’t abrade each other any more. Raise the beater to accommodate the corrected warp height. Put some little bumpers on it where it hit the castle. Sand the rusty, rough metal heddle bars smooth. Polish them like crazy to get rid of the discoloring metal dust. Figure out how to attach my Glimåkra raddle for beaming: modified ceiling hooks, as it turns out. And does this hundred pound sow’s ear deserve to be a silk purse, or firewood? I’m still not sure. 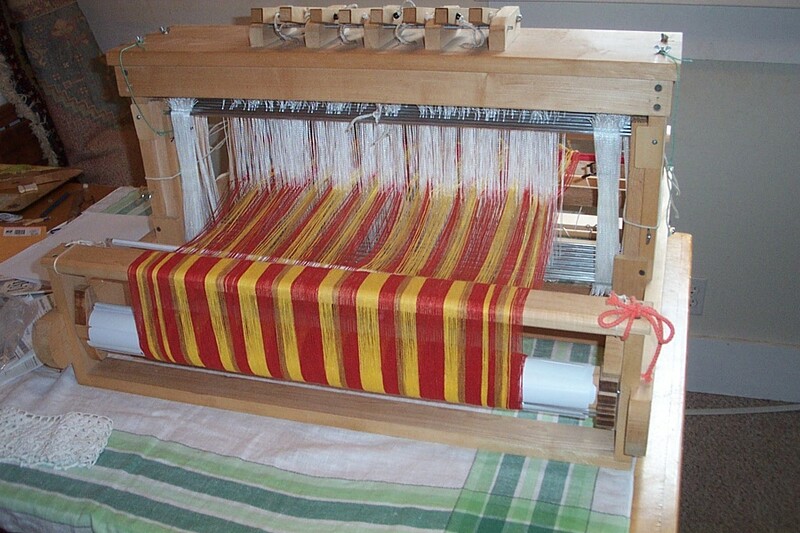 My trial warp is 2.5 yards of 13 wpi cotton/linen, which I am weaving up quickly into a 4-shaft, warp dominant runner. That is really not enough length to tell whether the possible variations in warp beam circumference are going to mess up tension over the course of the warp. Otherwise, it is doing okay. The slack in the lift cords doesn’t cause them to tangle. My irritations with the floppy floor of the shed are probably just par for the course when you try to weave close-set linen on a shallow jack loom. I’ll try it with all eight shafts, next.